Jason and the guys over at bbqaddicts.com have created a monster of a “chub” of bacon, sausage, and bbq. 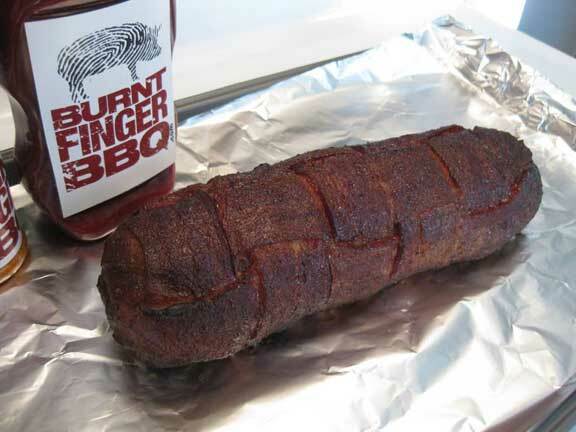 They are a Kansas City Barbecue Society (KCBS) competition team, Burnt Finger BBQ. This is their latest artery-clogging invention. It’s bacon! It’s sausage! It’s MORE bacon! There’s BBQ sauce, BBQ rub. More BBQ sauce. For anyone who’s ever smoked a “fatty” on their grill, this is the next level. Obviously pork is best served by itself, but if you feel the need to make this meat monster into a sandwich, try placing a couple Bacon Explosion slices on a warm Pillsbury’s Grands Biscuit. You’ll reach pork Nirvana is no time flat! 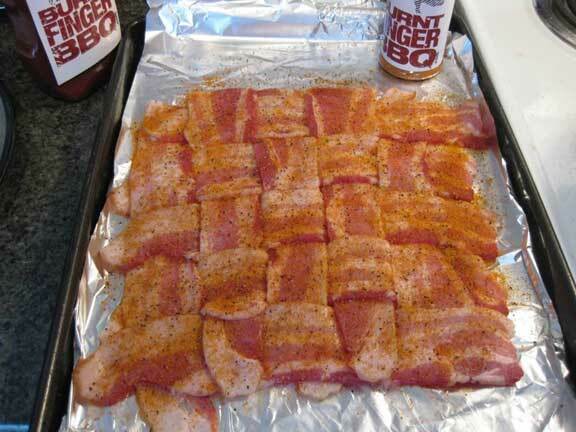 I’ve left out all the steps and delicious photos, because, bacon lovers, you gotta see this recipe. BBQAddicts.com go to the Blue Ribbon Bacon Festival in Des Moines, Iowa and cook over 30 Bacon Explosions! Oh.my.gosh. I can feel my arteries hardening just by looking at the pic. Whoa… I feel so hungry when I read this post. I bacon so much. So hungry right now and I wanna eat bacon, bacon and all bacon. I prefer to eat bacon with BBQ sauce than with ketchup and mayo. It makes me want to eat more! Oh my God looks so yummy, I can’t stop my self to drool when i saw this post. I could imagine red bacon dipped in hot BBQ sauce. Tastes really good! Wow, my day starts right with cheese and bacon at breakfast. Barbecue sauce bacon? any time of the day! 🙂 So love it. Geee…. my mouth is watering, when i read this post! it looks so yummy! nice post! keep it up! Wow! what a yummy recipe! I hope to make one! Its simply delicious to taste!!! Thanks for the post! I like this post! what a great recipe, love it! thanks for sharing this recipe. cheers….